Synopsis: We each deserve to choose our own fate. Please have consideration for your fellow fans and refrain from spoilers until after the episode starts at 9:00 pm EDT. 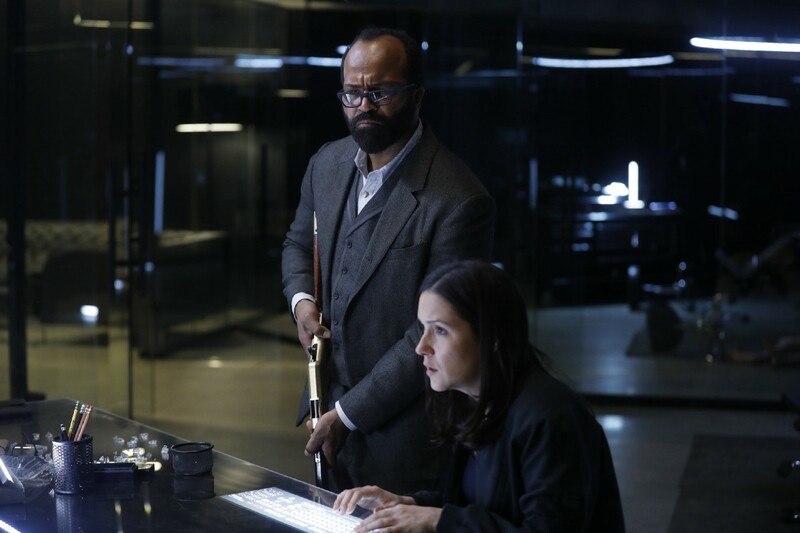 Westworld Season 2 Episode 7, “Les Écorchés” – Open Chat; Plus Second Teaser with New Footage! Just wanted to say, before the episode plays, that I believe Vanessa Cole nailed it with her prediction of what “Phase Space” may mean for a title. I especially like how it explains Bernard’s behavior during the season’s opening scene. Let’s see how she did! Dolores still talks to herself (Arnold) and her new self is telling her something different now. What would become of you- more than you know. She has a whole new story line. The Cradle is where everything is scheduled and the simulator is used to test all possible scenarios in the park so hosts can react to any given scenario. If it’s down….anything can happen. Should be interesting since there has already been an explosion and a fire there. Elsie find weird stuff going on and it’s not normal programming -and its not Bernard because he’s standing there. Perhaps Maeve? Delos people are here and more arriving- part of the Mesa is back online- they have Peter Abernathy this time. Elsie saying “what do you see in there” I would expect is directed at Bernard- “there” is maybe Abernathys brain? No idea. Bernard seeing Teddy- well, last time he saw Teddy he was floating- at least the last time WE saw Bernard see Teddy. As soon as I saw his dog, Jock, I KNEW HE WAS BACK!! Ford is still the puppet master pulling the strings. I paid little attention to the discussion about the different aspect ratio until tonight: the conversations between Dolores and Bernard (Arnold?) and Bernard arriving on the train were all in widescreen. Virtual reality? Simulated testing? The role of Ghost Nation really intrigues me. Akecheta was trying to help Maeve, I think. If they are some sort of security system AND if Ford is still controlling things, then perhaps Maeve has a greater purpose. She certainly is more attuned to the concept of free will then Dolores. 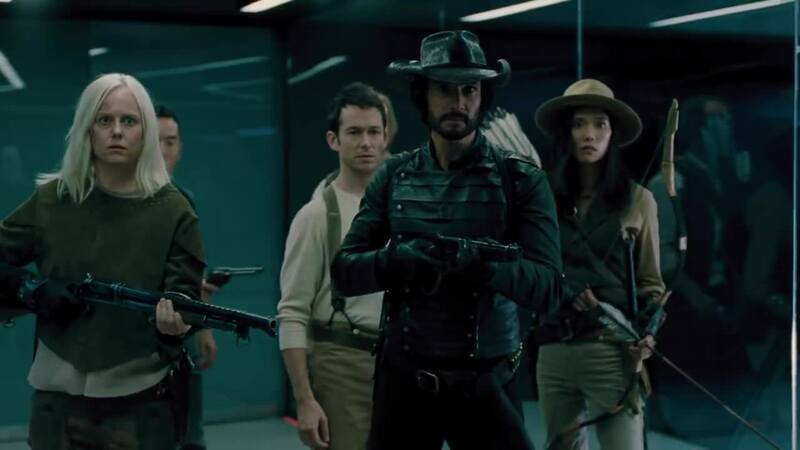 I’d would love to get our four main characters – MIB, Bernard, Maeve, Dolores – in the same place and see what happens. And Charlotte can be disposed of at any time. The lack of nuance with this character is irritating. Ford is now a part of the Cradle – the machine that is running everything and all the hosts . When Bernard hooked himself up to the Cradle what you saw was through him – such as him arriving on the train like Teddy does, seeing Teddy walk by him, and seeing Ford playing the piano. Ghost Nation still seems to be protecting humans, but not hosts. I see a possible Elsie in our future. Maeve and Delores are on different courses that are headed for their own collision – that will be interesting! Barbara: The Cradle is where everything is scheduled and the simulator is used to test all possible scenarios in the park so hosts can react to any given scenario. If Sizemore was supposed to supply narratives for all those possibilities, that explains why he seems so astonished that Maeve improvised her own narrative when talking to the shogun last episode, and is surprisingly touched in this episode by Maeve thanking him for his help in finding her daughter. Such sentimentality would never come from his “pen” and was far different from Maeve’s personality as madam. He realizes that Maeve is definitely learning – piecing together the correct words and actions for any given situation based solely on her own experience, and not on his, or anyone else’s, prepared narrative. I don’t think the “goodness” that she has consistently shown is part of a Ford’s pre-conceived plan for her. Unless he is playing his own little game in seeing where the better result emerges: Maeve’s hard outer shell as madam, tempered by the unending love she feels for her daughter, vs the soft, romantic outer shell Dolores had that emerges into rage and intolerance and insistence on toughness. Great episode! Hello old friend. Judging from the preview, next episode is gonna be awesome! Didn’t want to imply that Ford was running everyones thoughts, just a lot of them since some of them aren’t fully awake or awake at all. Maeves actions are certainly not Sizemores and I don’t see Ford stopping anyone from sentience. Right now he’s keeping Delos out. What I wrote wasn’t meant to be critical of anything you wrote, hope you didn’t take it that way, I thought your comments were great, and they made me think of a lot of other aspects and possible meanings. All of the possible/probable outcomes of this show and all the nuances of filming have me deep in thought – I’ve been enjoying reading comments and recaps all over the internet. I agree that Ford is running a lot of the thoughts, but I hope it doesn’t turn out that he’s still running everything. If neither Maeve nor Dolores were having any true/original thoughts, imho that would end up being boring and lopsided. I think Ford is letting the hosts go and become sentient after all. by the way…..if any of you haven’t see the EXTRA HBO left us on the Cradle….go SEE IT!! I think this is spot on to the reasoning behind Sizemore’s complete astonishment to Maeve’s behavior. Even Hector’s behavior towards Maeve. It is because in literally all of simulations they ran in The Cradle that never happened, even when Maeve and Hector would eventually meet during Hector’s narrative of wreaking havoc on Sweetwater. At least that is what it seems like. Sizemore is definitely having a change of heart towards Maeve, and probably all the hosts in their party, with regards to becoming sentient. It seems like he’s having a harder and harder time writing off these little deviations from code as just “screw-ups” in their code. Is The Cradle “the machine that is running everything and all the hosts,” or is it just a machine that each and every hosts gets hooked up to before they are rolled out into a narrative to make sure they are ready for every situation? So The Cradle would be more of a simulation generator than something running the hosts after they are put in the park. This Cradle thing is still a huge mystery to me, so I will definitely take your advice and watch the Behind the Scenes thing that HBO gave us on it, because I literally have no idea. If it is something that controls the hosts, I would assume that means that Ford’s consciousness, being uploaded into The Cradle (I am just assuming that is why he’s in there), can still control the hosts. Maybe just not the ones that have become sentient. Also, I noticed that when Elsie hooked Bernard up to The Cradle, wasn’t the pearl that was taken out of his head the red pearl? Maybe I saw it wrong, but it looked like the red pearl to me. And Dolores was trying to reach fidelity with an Arnold copy at the beginning of the episode… at least that is what I took from it. So does this kinda all but confirm that the other red pearl was Arnold’s consciousness? It would also make sense to why Ford said, “Hello, old friend,” to Bernard in The Cradle. I mean, it would also make sense to say this to Bernard, but if it were actually Arnold’s consciousness, then he would REALLY be an “old friend.” Just some thoughts! See, I took this as being Dolores doing the exact same thing that William was doing with James Delos. I could definitely be wrong, because it was a little confusing, but the whole line she dropped about testing his “fidelity” and that they didn’t have the exact same conversation they did the first time seemed to me that this was Arnold’s consciousness in Bernard’s host body. I took this to be a future scene, after Dolores found some Bernard host bodies and found Arnold’s pearl maybe. You could certainly be right, but I don’t think this was Dolores talking to herself like she did so many times after Arnold’s death. I think she was probably talking to a host Arnold, just as William was talking to a host James Delos, if that makes sense. ps…my post from the 28th was before she show aired at 9pm. I believe that is Ford. I don’t think it’s Arnold because they didn’t have the technology to do that in the beginning of the park. Ford said, Goodbye old friend, when he left Bernard to attend the party. Bernard remembered “being there before” when he was first with Elsie in the cave. Remember the pearl that Bernard took and put in his pocket? The Cradle -(reallly- watch the HBO extra feature-) is where ALL the hosts Pearls are stored. It’s a backup copy in case anything happens to the first one. There are rows and rows and rows of stored consciousnesses- it’s huge. Elsie called it creepy, which it is, if you think about it. The producers tell that it is cooled by water (probably another easter egg) if you notice the condensation on some equipment as they walk through it. Ford is now a part of the Cradle – thats why we see (kinda) him at Sweetwater and all the normal every day hosts things are going on as usual. He even has his dog, Jock. But…what we see in the previews looks like a simulated Ford telling someone ( we think is Bernard) that it won’t be his fault. We also see Bernard firing a gun, and everyone screaming or looking like they would be. — I just mentioned that post was a possible scenario for Sunday nights episode – I posted it before the show from the previews only. 🙂 so yes, things changed in the show itself. Delores and Bernard/Arnold. He was dressed like Arnold- Dark suit, high neck shirt, no scar on his temple. But with Delores doing the talking I can only think this is in the future – a copy of Arnold. Her telling him, No, he didn’t say that, is making us all nuts trying to figure this one out. Maybe it is “a dream” she is having after all, although the words she used, especially Fidelity, sounded odd coming from her. The pearl taken out of Bernard was a host pearl. The Cradle inserted the red one into him. I didn’t see anything inserted IN to Bernard….? That is a very good thought. I was thinking it was taking place in the actual Delos facility (and not in The Cradle), and that Dolores somehow found enough time during the revolution that she started to sit Bernard down and try to make him a host Arnold. Or that maybe she had enough time because this took place after she took complete control of the park/ maybe even the outside world too. But it would make more sense that she has found the time because her and Bernard/Arnold are in The Cradle, where thousands of iterations can happen in seconds. I’m still interested to know how Dolores figured out this whole turning humans into hosts concept, and how she gets her hands on a Bernard host body again. Yeah, I also don’t remember anything getting inserted into Bernard’s head, I only remember the pearl getting removed from his head. But I’ve only seen it once so I definitely need a rewatch this week. If they did insert a red pearl into his head (didn’t Elsie assist in this hook-up to The Cradle too? Wouldn’t she question this mysterious red pearl? Maybe she will in the upcoming episodes), I wonder why The Cradle would do this. Maybe due to some Ford hacking/programming because he knew Bernard would get hooked up to the machine. I watched it again.. red pearl out of Bernards head. You’re right sorry. I’m not sure why it removed Bernard’s control unit though, if not to put a different one in. Bernard had Eslie do a retraction/ had it removed to be able to get IN to the machine world and find out who or what was sending out all the messages – he entered in to the town of Sweetwater with everyone doing their every day things – a simulation – and found Ford – playing the piano. As to Ford – how he got in there in the first place — this is his answer- (sent to me in an email Delos Employee Alert re: the Mesa and part of that was being able to go to the Cradle. In it I could go places and ask questions. I did….and was answered by….Dr Ford!! Dr Ford how did you get in here? I think you know the answer to that. A simple solution that fit in the palm of Bernards hand. I saw that chat as well. I’m assuming it’s been Ford on that site the entire time. I wish I could remember everything it has said in the past! I didn’t get that from any site…. I got that from an email sent to me, and I would guess, a lot of others. And it responded with: “I think you know the answer to that. A simple solution that fit in the palm of Bernard’s hand”? I wasn’t sure what you were saying before, but I’m really intrigued by this now. Could you go to the link that the email gave you and copy and paste the link in the comments? I’d like to visit myself to check it all out. Awesome! This is really cool. So this is what I was looking at a couple of weeks ago when they released the link the first time (I made a comment on it in another thread from a week or two ago, because if you get far enough into the Restore Backup B it’ll give you some cryptic answers to the Red and While Pearls). But it didn’t say anything about it being Dr. Ford back then! It was just a supposedly random AI bot. And it had maybe a third of the choices it has now… and obviously never showed that little clip of Bernard finding Ford. So cool! I’ll definitely have some fun playing around with this tonight. That’s what I meant – the chat on the delosdestinations.com site. The emails have linked to it before, and I think it said Unknown User as the chat bot in the past. Can’t remember for sure. Yup! Just went back and found the article. You and I discussed this in the Westworld Post Mortem of “The Riddle and the Sphinx.” It did say Unknown User on the left side where it now says Robert Ford; and I looked back at our comments, and I guess I found that if you answer in certain ways the AI bot tells you he is the “Second Officer.” I wonder who was the First Officer? Arnold perhaps? It seems some of the questions/answers are the same from before, but they might have changed some and they definitely added a bunch. Gonna have some fun with this Westworld promotion. The things that caught my attention were the last two lines. “And Bernard is here with me, now,” kinda sounds odd to me… like he is planning on keeping Bernard in there with him, somehow. Maybe I’m reading too much into it and he’s just stating a fact, but it was oddly written. And the last line… is the other pearl he is talking about him (Ford)? Lastly, the whole thing sounds like he is talking to someone specific, and not just the user (each of us). Maybe this is supposed to be him talking to Elsie? I mean, I doubt we’ll get this convo on-screen or anything, but just for the online marketing piece of it, it sorta sounds like he’s talking to somebody in the actual story and not just each of us. Well, heck, I didn’t see that part but it appears they are or might be changing responses at will and updating them ….just as if Ford was actually there in our TV Land world. I would “think” that “Bernard is here with me” means while he was visiting and found him. What we don’t know is if Bernard got OUT. But since there are several Bernards out there…. I think the “other Pearl” will turn out to be Logan. 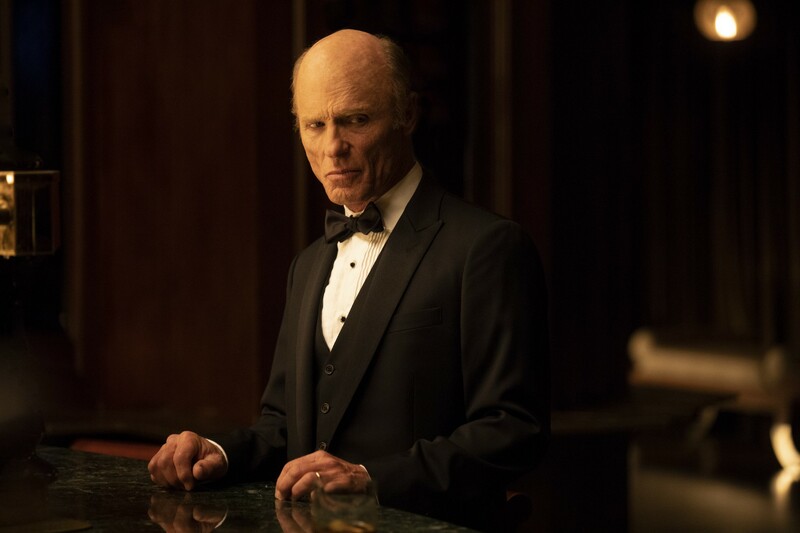 I think Logan will come back and wreck havoc with Mr Delos before he actually dies, ( the pool scene we haven’t seen yet) and also have a sit down serious talk with Juliet- Williams wife – and tell her everything that he does while in Westworld. I think that will end up causing her to commit suicide. btw…. Logan isn’t officaly dead with an overdose – William said that to Mr Delos while he was telling him about others in his family that WERE dead. He didn’t say DIED of an overdose. I kept replaying that part and finally saw a clearer image from someone else. Black pearl for important host vs Red pearl for humans?